A suspect is in custody; a federal law enforcement official has confirmed to NPR that his name is Dimitrios Pagourtzis, 17, who is believed to be a current student at the school in Santa Fe, Texas. Abbott said the gunman surrendered rather than carry out a plan to kill himself. A second person was also detained for questioning, police said, and a third who police said had been acting suspiciously is also being interviewed. The weapons used were a shotgun and a .38 revolver — neither of which were owned by the shooter. The weapons belonged to the alleged shooter’s father, who legally owned them, Abbott said. Police are “in the process of rendering them safe,” the district said, adding that the school had been evacuated. Law enforcement officers have warrants for two residences that have been linked to the suspect, Abbott said, adding that efforts to search them have been slowed by concerns that the properties might have been booby-trapped. Describing explosive devices that have been found, Abbott said that a “CO2 device” and a Molotov cocktail were among the devices that have been spotted in both a home and a vehicle linked to the case. Citing evidence from the suspect’s journals and electronic media, Abbott said Pagourtzis had plotted to carry out the attack and then commit suicide. Before Abbott’s update, area hospitals had said that they had received at least 12 people from the school. The Clear Lake Regional Medical Center said that two of its campuses have together taken in nine patients, and another hospital said it was treating three people who were shot. The shooting reportedly began before 8 a.m. local time, putting the school on lockdown and sending police rushing to the scene. Several witnesses have said the attacker was armed with a shotgun; reports have also said he had several weapons. As the situation unfolded, several ambulances and Life Flight medevac helicopters were called to the location, and a stream of them were reportedly seen leaving for nearby hospitals. 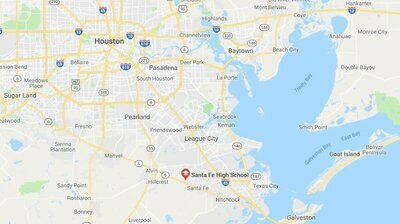 Harris County Sheriff Ed Gonzalez said that one officer of the Santa Fe Independent School District Police Department was injured and is being treated at a hospital. He did not have details about that officer’s condition. The University of Texas Medical Branch said it received three patients — two adults and one person under 18 years old — from the shooting. One of those patients, a middle-aged man with a chest wound, is in critical condition, according to Raul Reyes, the hospital’s director of media relations. The other two people had been shot in the leg, he said. “I heard really loud booms, and I didn’t know what they were at first,” she said, saying she realized what the sounds were after she heard students screaming. Paige said she and others took shelter in an area behind a stage after being told to wait before trying to leave immediately. The student said that she and others had trouble staying calm but that there was not a moment when she felt like what was happening wasn’t real. “We shut the lights off and we shut the door,” Butler said – but after the fire alarm sounded, they debated whether to leave, thinking the alarm might have been part of a gunman’s plot to flush people out of classrooms. Butler says the class made its way to a field behind the school, and she was able to find her younger sister, who had been in a classroom closer to the shooting. They eventually reunited with their mom, who took a group of students back to her house. The same school was the site of a false alarm about a shooting back in February. In that case, students and teachers reported hearing “popping sounds” outside, as Houston Public Media reported. Discussing the shooting at the White House, Trump offered his condolences and said his administration was monitoring the situation and that federal agencies are working with local authorities. “This has been going on too long in our country. Too many years, too many decades now,” Trump said, according to a pool report. As students exited Santa Fe High School, they left behind their backpacks to be checked by police and then filed onto a nearby grassy area alongside row of school buses. Images from the scene showed some students being searched by officers.